Updated July 22, 2016: Solar Impulse 2, a zero fuel airplane that uses SunPower solar cells, announced today it plans to attempt the final leg of its 21,747-mile 'round-the-world journey. The flight from Cairo, Egypt, to Abu Dhabi will set a world record for first solar plane to fly around the world. 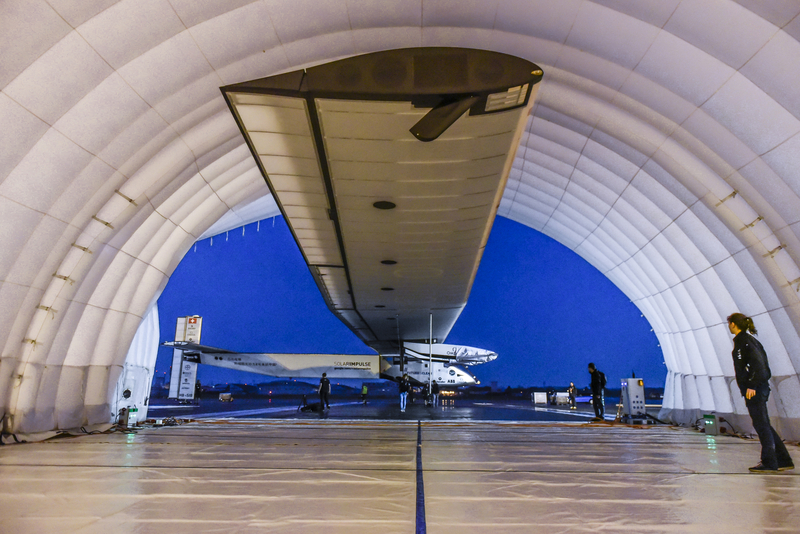 Learn more about the history of #Si2 in this blog post, originally published in March. 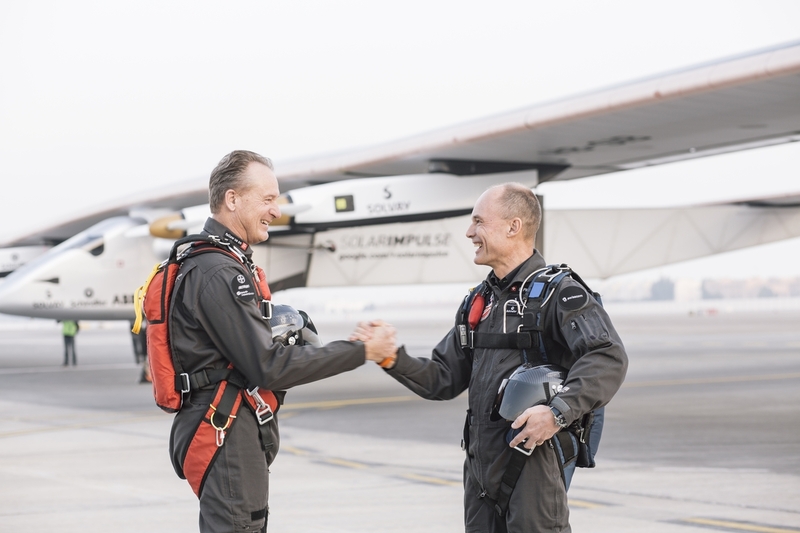 In April, Solar Impulse 2, the solar airplane that broke world records last July for longest solo and solar flight, plans to continue its ‘round-the-world journey using clean energy from SunPower® solar cells. SunPower — which provided more than 17,000 Maxeon® solar cells for the single-seater fuel-less airplane — has been working with the groundbreaking Solar Impulse project for eight years. We were chosen for the project because we design and manufacture the most efficient1 and durable2 solar cells available. Solar Impulse isn’t the first pioneering solar project we’ve collaborated on. From the Honda Dream, a solar racecar that won an 1,800-mile race across the Australian Outback 23 years ago, to a NASA rover that explored Greenland’s icecap, SunPower solar has helped set many records in our company’s 30-year history. That same technology is used to make our residential, commercial and power plant solar panels. The role that SunPower plays in the Solar Impulse project, which aims to publicize the infinite potential of renewable energy, helps illustrate why our solar is different from — and outperforms — conventional solar solutions. In 1999, adventurer Bertrand Piccard, a Swiss explorer and psychiatrist who initiated and became chairman of Solar Impulse, and pilot Brian Jones, became the first people to fly a balloon aircraft around the world nonstop. When they landed in the Sahara Desert after more than 19 days aloft, Piccard had a vision of one day being able to fly around the world without a drop of fossil fuel. The pilots chose SunPower because we offered the best solution for realizing their dream of solar flight. The solar cells we had perfected for the NASA projects (Pathfinder Plus and Helios) were quite light, flexible and thin while still delivering maximum efficiency and reliability. It took a team of about 30 engineers and 25 technicians, supported by an estimated 100 partners and advisers, four years to build the prototype airplane, which had the giant span of an Airbus A340 but nowhere near the weight. The upper wing surface was covered with a skin of nearly 12,000 embedded SunPower solar cells, while the undersides of the wings were coated with a high-resistance flexible film. On July 7, 2010, Solar Impulse 1 was successfully flown 26 straight hours. It went on to set eight world records when it became the first solar airplane to fly through the night, between two continents and across the United States. When it came time to build Solar Impulse 2, which Piccard is scheduled to fly next month 3,000 miles from Oahu, Hawaii, to the West Coast, many aspects of its design had to be improved so it could travel long distances across vast oceans. The team needed to: Improve performance to reduce energy consumption and increase reserves; modify the cockpit ergonomics; make the aircraft safer and more reliable, including building leak-proof electrical circuits to fly in humid conditions; and finally, make the plane as light as possible. SunPower’s next generation solar cells were even thinner and lighter so were again chosen for the project. The result: Solar Impulse 2, which first began its current journey March 9, 2015 in Abu Dhabi. It works by flying in the mornings to altitudes as high as 28,000 feet, collecting energy from the sun and storing it in lithium batteries. As night falls, it glides to lower altitudes, then taps into the batteries for power until daylight comes again. The flight hit a huge milestone last summer, breaking world records when Borschberg flew it 5,000 miles from Japan to Hawaii, where it has been housed while undergoing battery repairs. Where the plane will land after it completes its four-day flight from Hawaii won’t be determined until a few days before takeoff, scheduled for mid- to late-April. Possible destinations, weather depending, include Phoenix, the Los Angeles area and the San Francisco Bay Area. While some might be shocked at what the Solar Impulse project has accomplished, such a can-do spirit has long been part of SunPower’s DNA. Congratulations on your accomplishments so far, Solar Impulse! We couldn’t say it any better. © 2016 SunPower Corporation. All Rights Reserved. SUNPOWER, the SUNPOWER logo, DEMAND BETTER SOLAR and MAXEON are trademarks or registered trademarks of SunPower Corporation in the U.S. and other countries as well.